Tree-Free Greetings strives to use the best materials and processes possible. The Tree-Free Sip n' Go Travel Tumbler is made of premium quality stainless steel with a curved acrylic outer. BPA-free and Proposition 65 compliant, this durable tumbler holds 16-ounces of your favorite hot or cold beverage. Handwash only, the sip 'n go travel tumbler makes the ideal gift for any occasion. Save trees and spread joy! 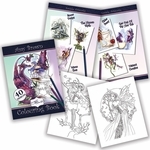 This design, by fantasy artist Amy Brown, features a lovely fairy sitting in the garden with her friends. The pixie has indigo wings with green edges, and wears a medieval outfit complete with blue dress, moss green corset and striped stockings! Imps keep her company, as well as a little flying dragon.